I had plans to research rafflecopter and start to plan out my giveaway, but that didn’t happen tonight. Instead I had two little ones who had no desire to go to sleep! Our spelling list this week is a review of high frequency words. We hand out our high frequency word list at the beginning of the year. The other two teachers on my team decided to use our geometry words as spelling words, but have opted to test over the high frequency words instead. There are about 200 words on the list and they have no idea which ones I will pick. My student teacher was supposed to do a game with the class to review some of these words. At recess she told me she didn’t like the game. After talking about a few ideas, I suggested we use the shaving cream that she’d found while looking for supplies in the cabinet last week. They may be in third grade, but they still love to write their words in shaving cream! It never gets old. This week is spirit week. The Irishman was kind enough to drop off some PJs for me this morning. Tomorrow is Time Warp Tuesday. I wore my mom’s old dress last week for our Harlem Shake, so I am at a loss now for what to wear. Right now I am thinking of wearing my late grandmother’s Cookie Monster PJs with pigtails. I also have a pretty big parent conference in the morning and I am not sure I want to be in costume for that. Decisions, decisions! I love playing Two Truths and a Lie with my summer camp kids. I can answer any question they throw at me with a straight face. I love the game – and the linky! 1. I broke the school record for the 400 meter run in high school. 2. I met my husband at summer camp. 3. I saw a shark while snorkeling at the Great Barrier Reef in Australia. This is hard, hmm I think #2 is the lie but I am hoping that it is #3. If I saw a shark, I think I would die on the spot. I think it's " I met my husband at summer camp". I love this linky...so we can link up on Sunday? I think it's #3! I don't know why but that one just struck me as the "lie". Love that game. Can't wait to hear which it is. Your post and raffle will be up on Thursday. Be sure to stop by! Rafflecopter is super easy! You won't have a problem. Thanks for participating in my giveaway! I hope it's number 3....Ahkk! 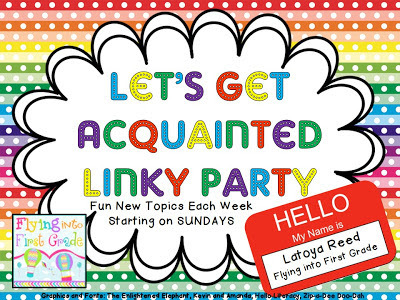 I am here because you are right before me on Latoya's link up. I too found the magical world of teacher blogs when I was on maternity leave. I have 3 little ones under 5. I am your newest follower. I live on Cape Cod and am so JEALOUS you are in sunny Florida. I'm going to guess... #1??? These are so hard!